Goal of Losing: Pecans are NUTS! I have heard great things about eating nuts as a snack. Something that I hadn't heard was how many calories are in them. Pecans for example; I snacked on a cup of pecans only to find that there were over 800 calories in one cup of pecans. What?! That's nuts! Since I was completely shocked to find how many calories were in pecans, I decided to look further in to nuts; a so-called "healthy way of snacking". I found an interesting article from www.sparkpeople.com on the subject. "We’re not nuts for saying it – a daily dose of nuts is a healthy way of snacking. Ditch the guilt and dig in. The only caution, keep it to about a handful. Healthy for Your HeartHow can a high fat food such as nuts be good for the heart? The biggest danger to the heart and arteries comes from saturated fats, found mostly in meat and high-fat dairy products. The fat in most nuts is unsaturated, the "friendlier" kind of fat that lowers LDLs, the so-called bad cholesterol. Cashews, almonds, and peanuts are full of monounsaturated fats. Walnuts are rich in omega-3 fatty acids, which are polyunsaturated fats similar to oils found in fish such as salmon. Don’t want to eat nuts alone as a snack? 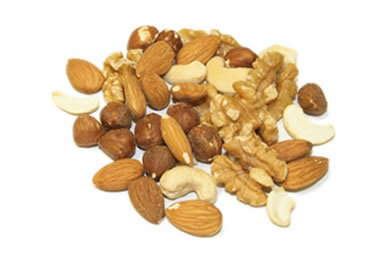 Use nuts as an ingredient for an easy way to control your nut portions if you don’t trust your snacking habits. There are many creative and delicious ways to add nuts to your meals. For example, toss a handful of nuts into a salad, stir-fry, pasta, or rice dish." Do you eat nuts as a snack? What are your favorite kind?